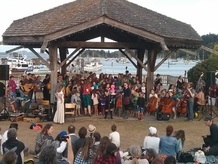 Fiddleworks Salt Spring Island is Fiddleworks' original family oriented camp. Fiddleworks' Artistic Director, Zavallennahh Huscroft planted the seed in 1999; she watered and nurtured it and today it's branches have grown to include so much more than just fiddles! Fiddleworks currently attracts world-class instructors and participants from all around North America. With an aim to unite and build community, this camp is full of unique music making, learning, and sharing opportunities, packed with meaningful and memorable experiences plus delicious food, all in an inspiring and beautiful natural setting. Each year the camp features 12-15 talented professional artists who form the faculty of instructors, teaching classes ranging from First Time Fiddle to Advanced Band Ensemble. Instruments have included violin, cello, double bass, guitar, banjo, keyboard, woodwinds, voice (singing and rapping! ), mandolin and more. The heart of the teaching staff includes a band in residence; past resident bands have included Laura Cortest and the Dance Cards, Genticorum, Jayme Stone and the Lomax Project, The Bills, The O'Schraves and The Niamh Ni Charra Band. Each year we welcome 150 participants ages 5 to 95 to join in the fun and to contribute to the community. 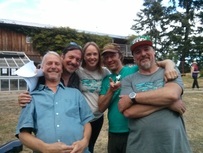 The Salt Spring Island Fiddle Camp is currently in its 20th year. Online registration opens 6pm on April 8. Everything you need to know about the registration process including prices, food and forms. Onsite camping and indoor accommodation, off site accommodations and booking form. Check out our wonderful instructors and their classes. Performances, dances, jams and more! Discover the smorgasbord of delicious classes our instructors will serve up this year! And get organised with our daily and weekly schedules. We hope we have the answers here.